It’s no secret that more and more drones are taking to the skies, and so it stands to reason that ‘drone sightings’ or near misses will become more common. However, every sighting and near miss brings the drone industry closer to an unbearable level of regulation that will likely stifle commercial innovation and kill the hobby for many. This latest near miss brings to light many issues faced (and misconceptions held) by modern day remote pilots. The first thing I want to touch on before we go further is to answer the first question most people ask when discussing this (and most other) near misses. Was the Remote Pilot doing anything wrong? So…this is an interesting question and probably has a million different answers depending on who you ask. I’ll weigh in on my thoughts here in a second, but before we open that can of worms, I want to look at the issue from a legal perspective. Let’s assume for the sake of argument that the RPIC in question was flying under Part 107 rules and see what it has to say. §107.37 Operation near aircraft; right-of-way rules. 14 CFR Part 107.37 is really clear about who has the responsibility of ensuring separation between aircraft. It rests squarely on the shoulders of the Remote Pilot. Now, we can argue until we’re blue in the face about whether this is right, but the fact is…Remote Pilots are second class citizens in the air and must always yield the right of way. In that sense, the Remote Pilot was in the wrong here. This is one of the most common (and most dangerous) misconceptions I hear from Remote Pilots of all experience levels. The belief that manned aircraft must stay above 500ft. is rooted in truth, and perhaps that is why it has proven so hard to kill. Plus, it just makes sense…keep the manned aircraft over 500ft. and the UAS under 400ft. Seems like an elegant way to ensure separation…if only it were that easy. So, there you have it. As long as it’s not causing a hazard to anyone/anything on the surface, all bets are off for helicopters. That is why we, as remote pilots, must be extra vigilant in areas of known (or expected) rotor traffic. Places like, Niagara Falls, the Grand Canyon, or anywhere on Maui are prime candidates for a drone/helicopter related mishap. So What About the Airspace? DON’T EVER RELY SOLEY ON THE DJI GO APP FOR YOUR AIRSPACE CHECK! For the love of all things Holy, check a sectional or use an app like Skyward, ForeFlight, or Kittyhawk…something, anything is better than just trusting DJI. So, let’s take a quick look at a sectional to see if we can find anything that would keep us from flying near Niagara Falls. While the Canadian side of the Falls is clearly Restricted (note the blue hash marks) the U.S. side appears to be slightly less clear. The Falls are outside the ‘magical’ 5 mi ring from KIAG and well outside Buffalo’s Airspace as well. So, if that’s all you’re going off, you’re in the clear. Many pilots would stop there and assume they are safe to fly. However, there does appear to be a Special Notice there about some Part 93 Special Air Traffic Rules below 3,500’MSL (yes…the FAA does believe that Part 93 applies to drones). A quick search for Chart Supplements for KIAG takes us to this FAA Chart Supplement. I wouldn’t expect anyone to read through 355 pages of data, especially not when we can easily search for ‘Niagara’ to find the details of the Special Notice. 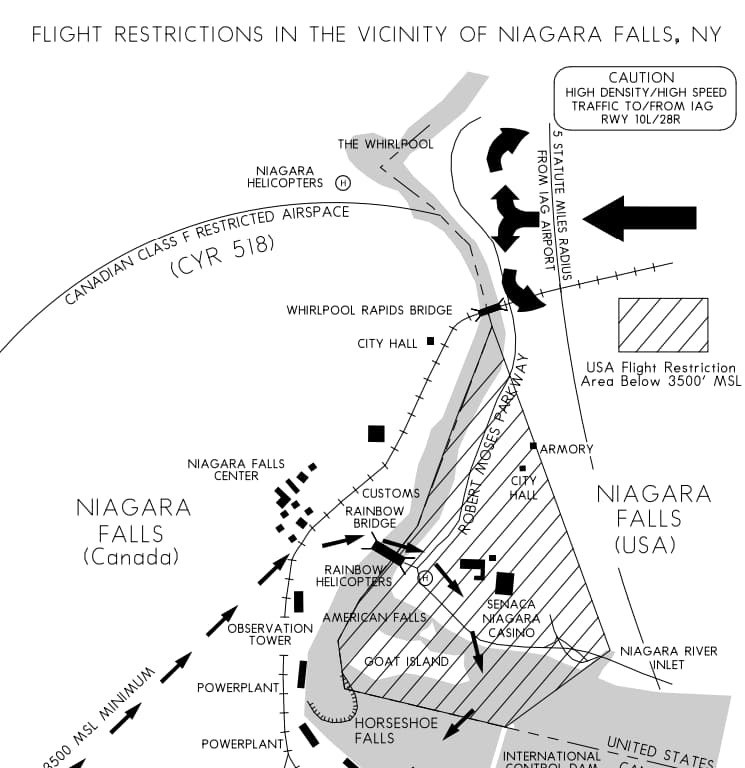 The search only returned two pages including the image to the right showing the restricted flight area around Niagara Falls. 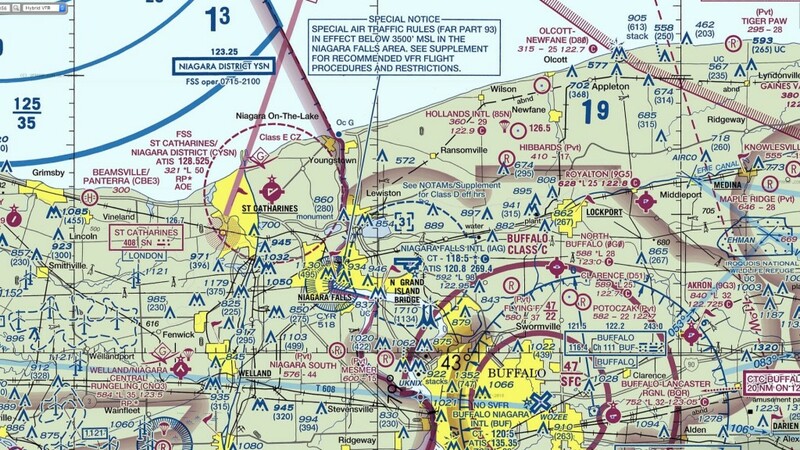 As part of the restrictions for this area, the minimum altitude for VFR traffic is 3,500′ MSL. Since all drone flights are considered VFR, this means that there are no drone flights in the area marked, which consequently was the area that the drone was in when it was almost hit. So, in the course of 5 minutes, I was able to pull up the sectional chart, which referred me to the Chart Supplement, which showed me the applicable flight restrictions for the area. So, why is it that we keep hearing about these near misses? It reminds me of the case where the Phantom pilot failed to check TFRs and crashed his drone into a BlackHawk near Coney Island. Is it because sectionals are hard? Maybe; it is the subject our students report the most difficulty with. I think the more likely cause is simply a lack of training. Manned aviators (and even Part 107 Pilots to a lesser extent) spend time and energy into learning all of the skills necessary to safely navigate the National Airspace. However, as drones become more prolific and the barrier to entry continues to drop, we must also make it easier for Remote Pilots to access and understand the airspace in which they are operating. That’s where the apps come in! Can one of the many flight planning apps identify the special flight rules in the area? Yep, just as I suspected…30 seconds with Skyward and the same Niagara Falls Special Flight Restriction is clearly marked. The problem is that drones have gotten so simple to fly, we no longer think that we need to think. So, the evidence suggests that the drone should not have even been in the air…but it was. This leaves me with one last question. If the pilot had positive visual contact with his drone at all times, how did he miss a helicopter transiting toward him? He reported that he heard what he thought was a helicopter and began looking around with his drone camera. Needless to say, the latency and narrow FOV make the drone camera far less effective than your own eyes when looking for traffic. A proper scanning pattern (or the presence of a VO) would have easily allowed the other aircraft to have been spotted, and the RPIC could have taken appropriate action. That is the most common failure among Remote Pilots (especially hobbyists) and is the catalyst for all the others. How many mishaps or near misses could be prevented by increased preflight planning and situational awareness? More importantly, how can we develop the culture of safety and airmanship that has taken manned aviation decades to cultivate? As someone who has spent the better part of his career in aviation and education, my first thought is training. How does a Remote Pilot know how to read sectionals or find Chart Supplements if nobody teaches them? Sadly, for most hobbyists (and even some Part 107 pilots) the desire to develop their knowledge is limited by the lack of legal and professional requirements. The FAA has shown that it is unwilling (or unable) to enforce the rules it has created. With no enforcement, what is the incentive to operate safely and legally? Since the FAA is not taking the lead here, I believe that we, as a community, must do it ourselves. While many are quick to deride the ‘drone police,’ there is something to be said about holding one another accountable for unsafe and illegal operations. If we don’t, no one will and the result will be more near misses or worse. I can only imagine the regulatory hell we will find ourselves in then. Friends, let’s be open to learning and be ready to teach others in a way that shows grace and respect. Whether you want to make a career or just a fun weekend, we all must share the skies in a way that shows we can ‘play with the big boys’. So, what do you think? Should he have even been flying? Does DJI need to improve/expand their NFZs? Also, have you ever had to correct/coach a wayward drone pilot? We’d love to hear how you did it without being pretentious and annoying! At Drone Academy, we try to bring you training, news, and reviews for all things drone (and we try to do it without bombarding you with popup or video ads.) If you’re thinking about buying a drone and want to help us out, it would be awesome if you could do it though our affiliate links with DJI, Parrot, or Amazon. It won’t cost you any more and we get a little something to help keep the lights on 🙂 Thanks!